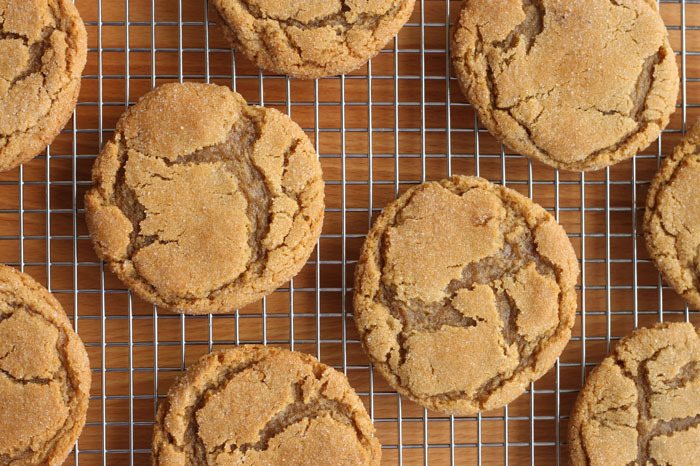 Chewy has got to be the best texture when it comes to cookies. Crispy is nice, but I'll leave that to potato chips, lasagna edges and tempura shrimp. Crunchy is great too, but I prefer my crunchy in the form of French baguette crust, and biscotti are the ultimate exception. Soft is lovely right? But it can get boring. Chewy is ... well it's like a combination of soft and crispy...it's somewhere in between. It keeps your jaw moving and makes you savour. These cookies are just the best because they are rolled in sugar so that the outside is crunchy and the middle is soft and chewy. Senses overload! An extra egg yolk gives them rich flavour and gooey centers when warm. They spread nicely to produce a crackled appearance as though there was a localized earthquake in the oven. The sugar-coated crust separates as the dough spreads with the heat of the oven to expose the soft and ooey gooey dough in the center. Just the right amount of baking soda makes them brown nicely and spread the right amount. Can we discuss baking soda for just a sec? Baking soda is pure sodium bicarbonate and it is alkaline (or basic) as opposed to being acidic. When exposed to heat and acid, it reacts to produce carbon dioxide which makes our baked goods rise. The wonderful thing about the alkalinity of baking soda is that it promotes delicious browning reactions (called Maillard browning). It also promotes spreading because it reduces the setting temperature of the dough or batter. It's Science. I'm a nerd. A really satisfied, cookie-stuffed nerd. 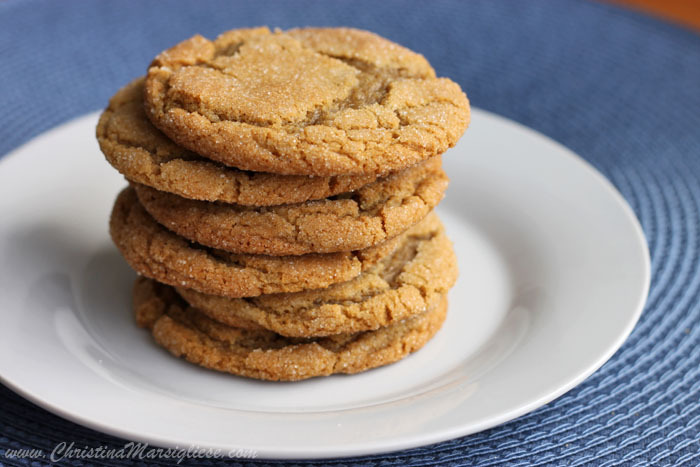 I've even left out the ginger in this recipe and made some lovely and simple brown sugar sugar cookies. The one thing you must do is let the dough chill in the fridge for a few hours or even overnight to hydrate the dough. It's important for flavour and texture. It also allows the baking soda to get evenly absorbed for even browning. I know it's so hard to wait. Patience is definitely not my strong point, but you will be thankful when your cookies turn out so perfect you could cry. Don't cry though. Just smile. Or make a loud evil laugh. In a medium bowl, whisk together flour, ginger, baking soda and salt; set aside. In a large bowl, cream together butter and brown sugar by hand using a wide rubber spatula until somewhat light and smooth. Stir in molasses. Add whole egg and stir until well incorporated and smooth. Stir in yolk and vanilla extract until combined. The batter should not look curdled. Add flour mixture to the butter mixture all at once and stir until most of the flour is absorbed, but a few streaks remain. Do not over-mix. You should end up with a soft, somewhat moist dough. Place a piece of plastic wrap directly over the surface of the dough in the bowl and refrigerate for at least 3 hours or overnight. This mainly allows the butter to firm up so that it doesn’t melt too quickly in the oven, letting the dough set before the butter melts and spreads. This way the cookies don’t spread flat like pancakes and remain a bit gooey in the middle even once the tops are golden. Line two large baking sheets with parchment paper and roll 1-oz mounds of chilled dough onto balls and then roll into sugar. Place them on prepared baking sheet spacing them 2.5 inches apart Bake until golden brown and cracked at the surface, about 10 minutes. 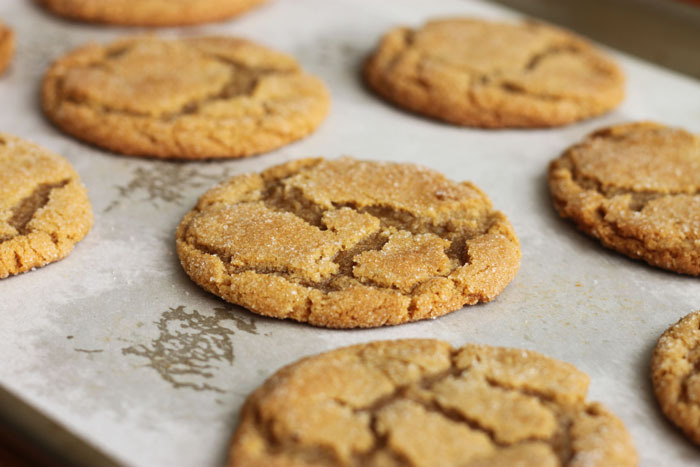 Let cookies cool on baking sheet for about 30 seconds before carefully transferring to a wire rack to cool completely. 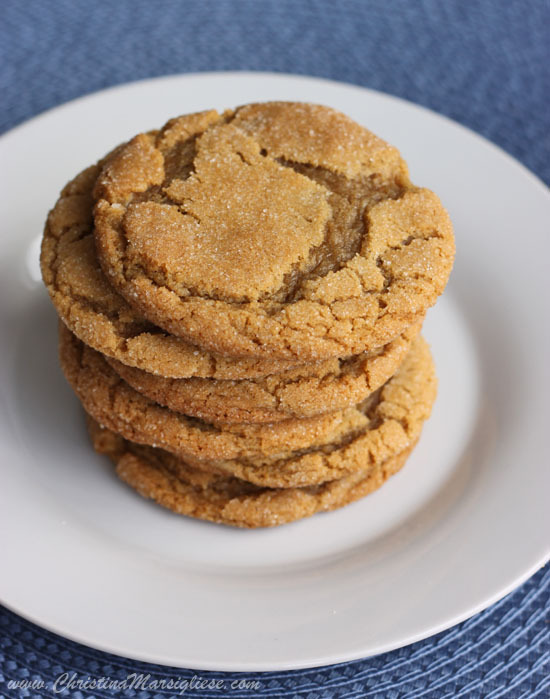 Ginger and brown sugar sounds good! These cookies look really lovely. These look so tasty! Just wondering why you cream together the butter and sugar by hand instead of using a mixer at the beginning? You say to mix both sugars but only list one can you correct this? Good catch! It's just the one sugar (brown sugar). those cookies look perfect. love the crinkles! these look fabulous! i'm totally gonna try them out. Mmm. I love cookies like this! I am definitely going to have to try this recipe because they look great. Hello, why do you specify to cream by hand? Working by hand incorporates less air into the dough so that it is more dense and more chewy. Wow, these look incredibly delicious! I want a stack of them in front of me right now! Just made these-they're incredible. So chewy, so delicious. Thanks for the recipe! I made these and was disappointed that they didn't look like yours. Then I started eating them and didn't care anymore. It is impossible to keep these cookies out of my mouth, it's like a gravitational pull. 2/3 cup of butter seems like more of a liquid measurment....what would the oz conversion be( keep in mind that there are 4 oz in one stick[8tbls])? Hi Julia, you absolutely can add chopped crystallized ginger. I have made them like that before. Thank you so much for your kind words and taking time to let me know!